The degree that the Schumer and Pelosi lead Democrats will go to prevent Donald Trump from having the promised wall is truly disgusting and appalling. They say they want border security but they sidestep the details, citing lofty pie-in-the-sky technology, drones and electronic sniffing devices, most of which have been on the job for years, but have only detection and no deterrent properties against a couple of thousand determined illegals who rush in and overwhelm our border security. Pelosi and Schumer who never met a pro-abortion bill they didn’t like now plead compassion for children, while the two wax figures who rebutted President Trump the other night showed about as much compassion as a rattlesnake, their cold, stiff, almost inhuman demeanor and appearance more closely resembling a cold-blooded apparition than a warm-blooded human being. People wake up, do you think the likes of Pelosi, Schumer et all give a horse apple about anything but power and the ultimate goal of this diabolical duo is to naturalize millions of new Democrat voters, creating an unbeatable majority that wants to turn our nation into a godless, socialist purgatory. And with socialism comes totalitarianism, you can’t have one without the other, because force is the only way the elite can stay on top. Anybody with enough sense to walk through a door without bumping their head can see where this is heading, knows that a properly built wall sill stem the flow of illegals and knows that the Democrats know it will work and therein is the rub. There are sections of walls that work now, San Diego, El Paso and other border areas have short stretches of wall that have been extremely effective and the Democrats know it and know that if Trump builds the wall it will severely curtail their dreams of ultimate power and a stranglehold over everything in the United States, plus reveal, that as in so many other things, they don’t know what they are talking about. Guns would be confiscated, there would be no restrictions whatsoever on abortion, taxes would be through the roof, global warming - the new religion of the left - would become front and center and American manufacturing would, again, begin a monolithic evacuation. Getting any kind of license would become a nightmare as self-governing bureaucracies would hire inept political cronies and inefficiency would slow the process down to a snail’s pace. If you don’t you’d better let your voice be heard, because with the Democrat/media cartel it can happen very quickly and you could wake up one morning to find out that your country had been pulled right out from under you. Note, don’t look for the Republicans to save you, it like a mass castration has taken place on that side of the aisle and there’s not enough testosterone - and its female equivalent - left to muster anything but a milquetoast acquiescence. I'm with you Charlie ! I didn't get this old and ugly from being a sissy. We shall fight my brother. God Bless America !!!! I'm with you 100 percent. I am a veteran as well. I believe that the wall should be built cause our country is being taken away from us very quickly. Not only by Mexico but other countries as well. My wife and I are over the road truck drivers and we see different things every day there are more and more people that are from places such Iraq and Afghanistan that are coming here supposed to be refugees but in turn are terrorist trying to distroy our country. Since I come out of the US Army in 2003 I have seen more and more where the United States of America is turning to be more like a 3rd world country instead of the land of the free like it is designed to be. I believe that if more people back President Trump's wall that hopefully one day before it is to late the wall will go up and this great country will be great once again. Let me just add my wife and I have been fans of yours since we were babies and I just turned 40 yesterday. Charlie, read your entire article! Well thought out, well written, and RIGHT ON THE MONEY! Glad you are better! I, like you, will not go down without swinging the bat hard and often! GOD bless you and your family! I agree with you, Charlie! I have 2 great grandsons and I want them to have all the freedoms that I have had! The only reason the Dems don't support it is because of Trump. If Obama wanted it,it would be done by now. Stand firm, mr. President. We can't allow the NWO socialists to succeed. The Census is coming up and Illegals are allowed to be counted. What gives the States their Electoral Votes is the population. Even though Illegals aren't Voting, they are stealing Votes from States with less population via Electoral College Votes. (This is EXACTLY what turned a once Strong Republican California into a Blue State. As has been stated, most of the drugs come across points of entry and many folks enter illegally through airports overstaying their VISAs. An effective way to crack down on much of this is to punish the American companies that hire them for cheap help. Of course, that would hurt our POTUS who has hired many of these folks himself to work in his own business. How did the Democrats treat Cuban refugees during the Obama Administration? Like enemies. ..... and note that the Cuban refugees really ARE fleeing from a country which jails and tortures freethinkers. I am with you 100% Mr. Daniels. Praying people will wake up soon. If we as a country don't do something right away and stop the mass invasion of the people from South America and other countries south of our border we will end the freedom we have now to heavy taxes to feed and house the homeless hoards which is already happening and is going to be a huge issue. It amazes me that people in this country have no issue with that. I certainly do. Everything you say is spot on. Like you I will go out swinging. At that point there is nothing else to lose. You are so right, Charlie. We have been silent long enough. For some reason, people think it’s bad etiquette to speak your mind. Silence is what has gotten us where we are right now. We are letting our kids and grandchildren down if we don’t stand up for their freedom of speech, their right to religion, right to own a gun, and for their protection against those who are here to harm them. Speak up before you don’t have the right to speak. As long as we breathe we can, and must, continue to turn this ship around. Thank you. HEY I GOT AN IDEA, NASTY nancy ask President TRUMP not to address the joint session of congress until after the shutdown is over. why don't we ask mr.PRESIDENT to address the nation since congress is sitting on their BEHINDS . He can address the people without NASTY nancy having anything to say about it. If they want to talk symbolism then I have one for them. They ask what does a wall say? I ask what does no wall say? What does it say when someone has full border security with a wall? It means they value what they have and take it seriously enough to secure and protect it. What does it say when they put nothing there? It says we don’t value what's inside. But I see absolutely and resolutely no reason why physics should not be a part of it. Interdiction is not a goal since that is just musical chairs. I always thought the primary objective was prevention of the crime in the first place. We don't need the illusion of security. But if that were the case a wall helps, unless of course they really don't mean to secure the border. Everything else is only treating the symptoms. (and we have our hands full treating all them) So why wouldn’t we want to remove the symptoms? When they tell us that physics don't work it astounds me. Who do they think they are talking to? 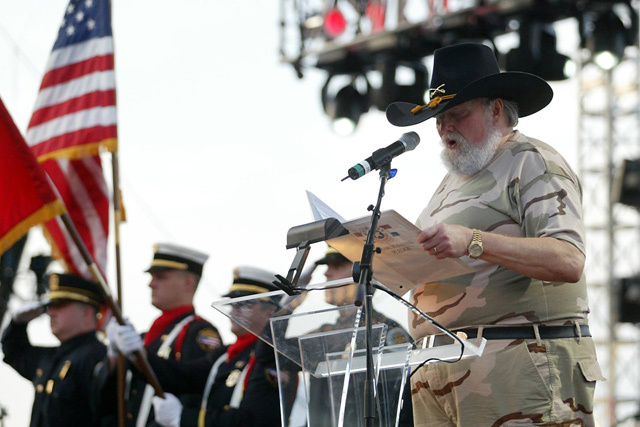 God Bless you Charlie Daniels! What an incredible article! I stand by you 1000%. I live in crazy California. My beautiful state is gone! It’s a third world country and getting worse every day. We’re heading to the Carolina’s and can’t wait to get out! Thank you for spreading such a strong and precise message. We all need to fight this dismantling of America! You hit the nail on the head with this article. Thank you. We need more border patrol agents. *** you Charlie. You and your Confederate flag can go **** yourself. No wonder I always liked The Marshall Tucker Band better. The Caldwell's have some common sense.